Choosing the right kind of dinnerware can be an intimidating task, and most of us rarely know where to begin. The general idea is that quality tableware requires a sizeable investment, and as that hampers us, often in the process, we end up settling to buy just the staples. Janaki Kirloskar of Kika Tableware is on a quest to change that notion. 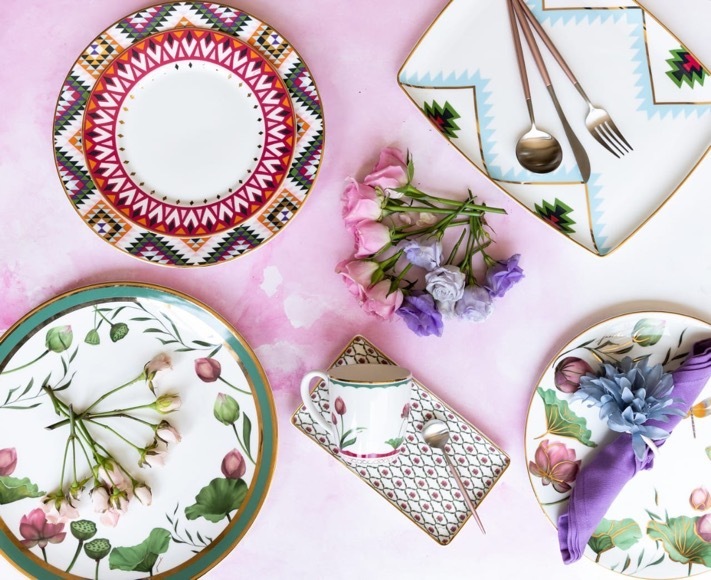 She asserts, that fine dining and special occasions aren’t mutually exclusive, and launched her brand of premium quality tableware at an affordable price point. Her aim is to offer luxurious tableware to her customers while maintaining an affordable price. Kika Tableware offers a variety of products including dinner plates, quarter plates, serving platters, serving bowls, mugs and tea sets. These are made from premium bone china and are gilded in 24k gold or platinum. Kika offers a varied set of 6 design collections that complement each other, with prints ranging from Aztec to Tropical. Her collections have been designed keeping every mood and time of the hour in mind. From day to night, her pieces transition seamlessly giving your table a fresh look at every meal time. Janaki encourages you to mix and match her pieces, so one can give it their own sense of style in the process. The Tropical Paradise Collection is bright, fun and has a modern take on nature. This rainforest inspired collection allows you to immerse yourself in dense greenery while showcasing brilliant flora and fauna through vibrant imagery. The primary colours used in this collection are blues and greens, reds and pinks accentuated by the 24k gold plating on the pieces. Janaki tells us, “This collection looks best when styled with green leaves, wooden table, natural coloured mats. As this collection is inspired by nature, it is best to keep the table styling elements to also be as natural as possible and infuse that total summer vibe. This Kashmir-inspired story comes to life in a tranquil setting where green dewy lotus leaves meet the smell of the wet earth fills the air and the magnificent pink lotus rises above it all. If you are looking for a floral collection, this is it. The Lotus Pond Collection was created with hues of the two main colour – pink and green. This collection is best suited for lunches, afternoon teas, a special celebration. To bring out the beautiful designs of this collection, we recommend to style it in the same soft hues of pink, green and white. Pink tablescapes will always be in style and there can never be enough of pink. Janaki recommends, “To create this pretty, ooh-la-la tablescape, start off with a white lace tablecloth. 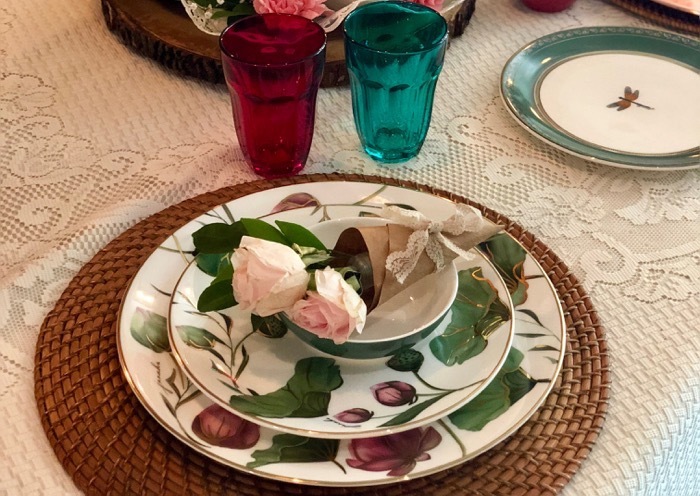 Add hues of pink flowers, roses, carnations, and place them directly on the table as a long floral runner or use crystal vases to accentuate your table. You can always add a hint of green in the napkin just to break up the pink. If you want to step things up a notch, add in gold charger plates and gold cutlery along with beautiful pink crystal glasses. The Gilded Graphic Collection is an Ikat-inspired look. In this collection, glamourous meets modern, opulence meets minimalism. 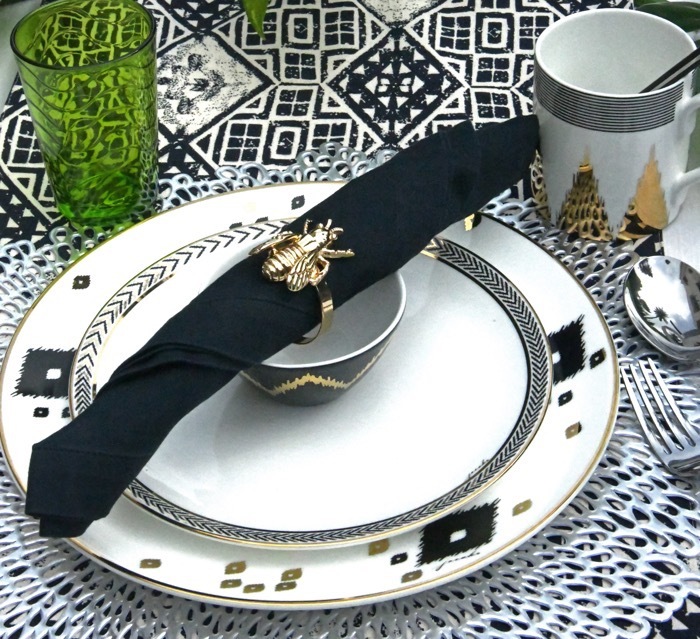 The table styling options for this black, white and gold collection are endless. This collection has the potential of creating a full black-tie dinner gala look with just a few simple table styling tips. “Start off with a plain black tablecloth and add a sequined gold runner in the centre. You can add in beautiful red roses as floral arrangements and also use red coloured fruits and dried flowers to hype up the look. We recommend using gold lanterns or gold candle stands to add in some shimmer to this stunning look. Black, white is gold is so versatile that one could totally style this with a pop of colour. Yellow stands out brilliantly against the black & white. We recommend to use tall glass vases with a single type of yellow flower – long-stemmed roses are perfect for this occasion. You can add in yellow napkins and also perhaps add colour by using plain coloured yellow serving dishes in addition to the ones offered in our collection. This collection was Ikat-inspired and has a lot of geometrical prints that can pair very well with the collection. A beautiful gold herringbone runner or a black and white ikat printed runner will bring out those patterns and borders of the tableware. 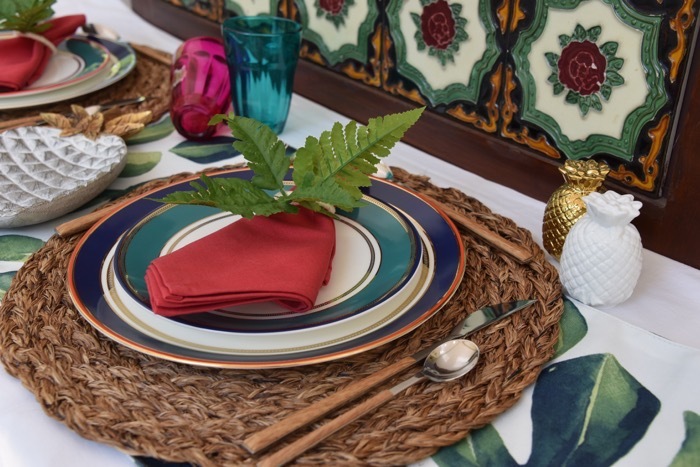 Don’t be afraid to experiment with layering – I find that layering a herringbone and sequined runner of different widths can really add unexpected drama to the table setting.” explains, Janaki.